There is a number of academics (and coaches and consultants) who have both a strong presence online and do a marvellous job of writing excellent blog posts as guidance for undergraduate, graduate students and early career professors. Two of my favourite who write specifically about literature reviews are How To Do a Literature Review (written by Aurelie) and Literature Review HeadQuarters (written by Ben – see this helpful post of his on when to say “I already have enough literature, thankyouverymuch“). I would refer you to their websites so that you can learn a lot more about how to do literature reviews. Recently, I was asked to write about how I do literature reviews. I could simply point you to Ben and Aurelie’s blogs, but I figured I could contribute something to the list of posts on academic workflow techniques. 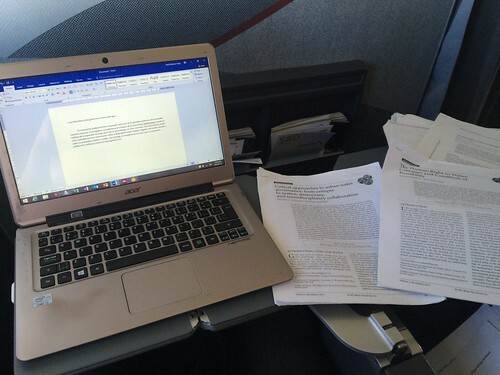 In my case, there are a number of things I could share about how to write a literature review, but I want to focus on 3 major themes that I think are important to the way in which I write my own literature reviews: citation tracing, concept saturation and mind-mapping of results. These three concepts are interrelated and quite relevant for anybody writing a literature review. First, to find whether you have read everything you need, you must engage in citation tracing: you will need to find the key references across the literature for your particular project. Then, you need to map whether your literature review has reached concept saturation: have you exhausted the field for the specific topic you are working on? And finally, you will need to lay out how different citations, bodies of work and key concepts relate to each other. I normally do this using the technique named mind-mapping. Citation tracing refers to the activity wherein we trace which authors cite which work, and the relationships across these cites. 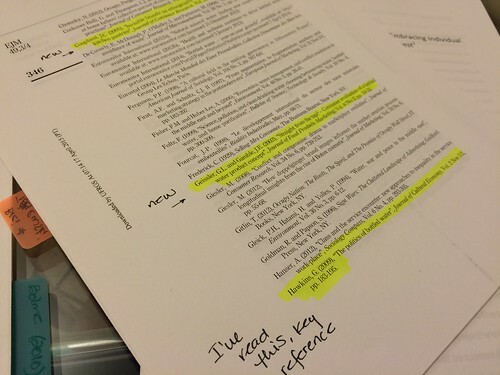 For me, citation tracing is fundamental, because it allows me to see whether there is a gap in the literature, and how each author is working through the concepts. For example, I have seen about 4 articles on the human right to water and how to implement it from a policy perspective. None of these articles actually link to the literature on policy implementation. They talk abstractly about policy implementation of the human right to water, but they fail to link to the literature. How did I know this? Because not only did I read the article, but also looked through the reference list. I did not recognize any articles that were specific to the policy implementation literature (a body of works that I know very well given that I teach the omnibus course on public policy theories). There are different ways to do citation tracing. Aurelie offers a good overview using Google Scholar. Generally speaking, I combine two methods: the first one is a Google Scholar backtracking search. I search on Google Scholar for the keywords I aim to do, and restrict the search to the last two or three years. This allows me to find a few (generally 4-5) relevant articles, which I then try to read and write a memo (if I decide using my triage technique that memo-ing the paper is worth my time). 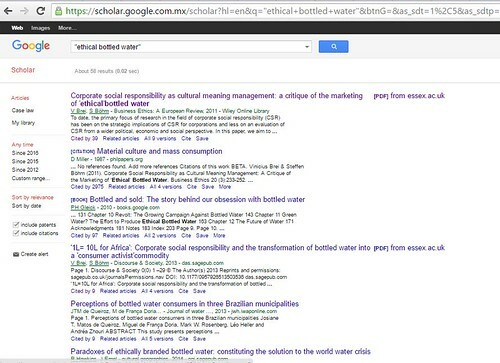 As you can see, I searched Google Scholar for “ethical bottled water” and found a few articles that are relevant. The problem with Google Scholar is that sometimes, depending on the keywords and sequence, you end up having to sift through several pages’ worth of results. In this case, both the Hawkins and Brei and Bohm articles are present in both searches, which means they might be relevant to my search. As you can see, the set of results and citations you will get changing the wording slightly may be completely different, which is why it is important to make sure that you use different combinations of keywords. 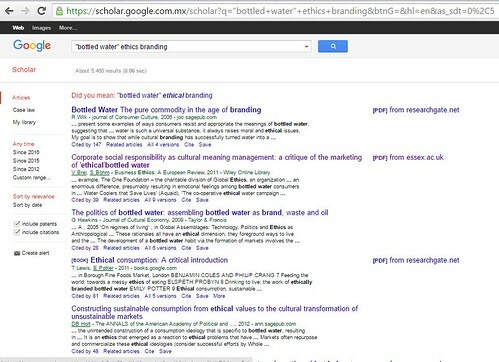 See the results of a different set of keywords related to ethics, branding and bottled water. The second one is a narrow Mendeley keyword search, as I show in the figure below. 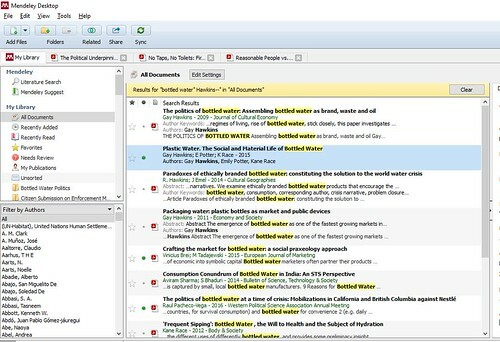 I search my 6,000 entries’ database on Mendeley for specific keywords. Usually (and Mendeley is very good at this), the top 5 items in the search will be pretty relevant to what I am trying to find. Below you can see the citations for the top 5 entries that are specific to “human right to water”, “policy” and “implementation”. In both cases, what I do is I read the article, then quickly search through the references’ list and make sure that I have read some of the references. I usually find one or two articles that are very relevant to my research and that have been cited often. I highlight those, and remark if I have read them, or if I haven’t, whether they look relevant enough to try and find them and read them. Here is where concept saturation comes in. I define concept saturation as the point where I am seeing the same citations repeated on a regular basis. I borrow this term from qualitative research methods, as it is also the point when you are seeing the same concepts repeated over and over again. For example, I think much of the work around ethical bottled water has been done in the marketing literature from a branding perspective. Methodologically, I have seen most of the work using qualitative discourse analysis. So, when I start seeing yet another piece on bottled water branding using qualitative methods, I think I have reached concept saturation. Time to skip to a different approach. For example, the work of Gay Hawkins has been fundamental in developing the notion of bottled water as an assemblage. I have looked through basically all her citations, and read all her work. See the Mendeley search below. Basically, I have used Gay Hawkins’ work to map everything scholarly that there is and that is related to a “material culture” approach to understanding bottled water. Once I found that every single author I had in the short list of cites that I had to review in my citation tracing process were associated or citing Hawkins’ work, I knew I had reached concept saturation. Another idea that I have seen floating in the bottled water literature is the idea of “accumulation by dispossession” promoted by David Harvey, and implemented by Jaffee and Newman, so I went and read their work until I found no more citations associated with this idea. 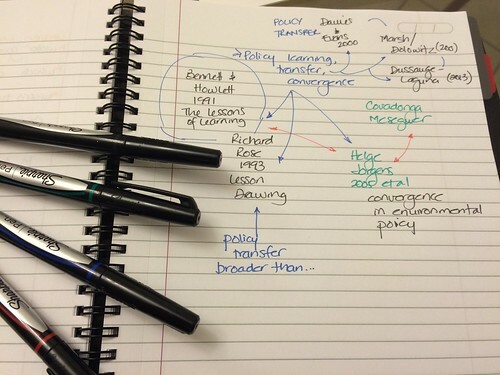 Below, I show a brief and incomplete mind map of the literature on policy transfer, policy learning and policy convergence. If you are a scholar of public policy, most likely you will recognize these names. Obviously you can make the results’ mind map as large as you may need it. When I am mapping a large body of literature I usually do it on a whiteboard or corkboard and use Post-It adhesive notes (one per each relevant author or concept). Then I link the different ideas in the mind map using different materials, depending on which surface I use to create the mind map. I also love putting the mind map on paper digitally, using mindmapping software like MindManager. I am hopeful describing the processes I follow to undertake my literature review is helpful to you. I know it’s kind of weird for someone as connected and tech-savvy not to use a mind mapping technique that is more modern, but I am sure you can hardly find better tools than using hand-written notes. Tagged with academic writing, AcWri, literature review, productivity, research, research methods, writing.